Wow, cutting all that out loks so time consuming...was it?? 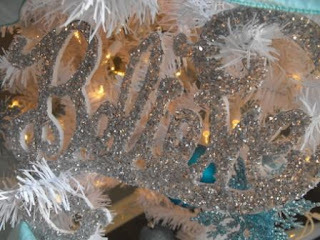 I found glittery words like that at hobby lobby. Yours are gorgeous and probably less expensive than HL. I love that idea. I think I'll try that myself, you're right they are way too pricey in the stores. Would this be a bad time to tell you I just bought 10 of them at the dollar store? Yeah...probably. :) They're beautiful, Susie. AND you gave us an idea! Wonderful! How do you come up with all these great ideas? The best part is that you can cusomize them to your decor! Hope you and your family have a very Happy Thanksgiving! Wow, you did a great job, Susie!! I have actually seen those at a new store at our mall for just a few dollars. They were MS from Macy's originally, I think. wow, I've seen these for sale downtown!! 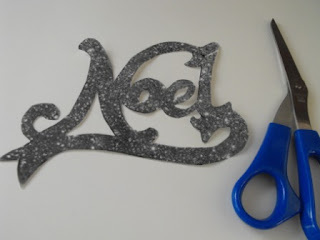 Great idea for those of us with the foam core and glitter just waiting for a new purpose. I knew they were sitting on that shelf waiting for a great project. Thanks and keep up the creative works. I love them!!! I hate that you didn't find these at your Dollar Tree. Mine had them in silver, gold, and red. Hummm.....However, yours look even better than mine. They look great. I bet that was exhausting cutting out all of them though. Your project turned out GREAT! How neat hun! Yours is very cute. I'm a little shy of the glitter right now. My 14 year old just finished a big birthday poster board for her friend's birthday tomorrow. She did her little "project" in our kitchen while I was out. It looks like a glitter jar exploded all over my counters and floor AAUUGGHH!!! I love these and love that they look a little bigger than others I've seen. They look great! I have a ton for our smaller tree and got them for about $3 each years ago...and of course now they are $1. Sheesh. 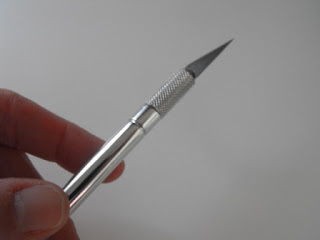 I'm an x-acto knife freak, don't know what I would do with out mine! Those are so pretty! I love the all I want for Christmas photo and the silver tree in the background. You have such a creative mind. Thanks for lending it to us. So talented - I don't know how confident I would be with that xacto knife and all those curves! They look great! I love a little glitter! What I think is so cool about this is the flexibility you have to size those words and change the font to suit yourself. Now a decorating diva won't be limited to the offerings of the mass discounters, I love me some custom decorations! And I always have pieces of foam core board laying around... now to search for glitter. *smiles* Thanks for sharing this great tip! How was your show? Make lots of $$$??? I sure hope so!!! HI Susie, this is beautiful, absolutely beautiful. I saw some house/cottage fronts that were glittered and decorated for Christmas cut out of wood and they were $$ but your idea would solve alot of things...really any cut out of wood could be done out of foam core board. Awesome idea! Have a blessed Thanksgiving week! Beautiful! I love that M.S. glitter, don't you? It's so pretty and sparkly...and what's not to love about that? Cute, Susie! Great idea to try it yourself. I bought some glitter last year for my pinecones. Love the stuff! What a great idea!! 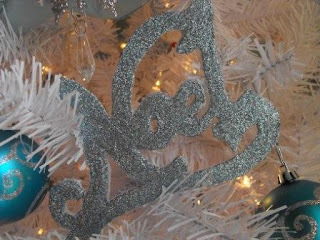 It turned out so beautifully :), and they look lovely in your tree!! You are amazing! Those turned out great! Our dollar store had some, so I stocked up. But, now I am thinking how many I could have made like that! But, I am afraid I lack the creativity and patience that you have in abundance! You are so frugal, clever and crafty! Adorable! 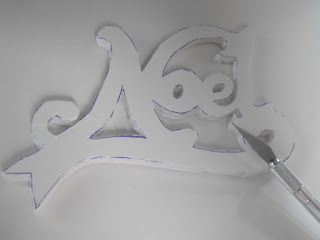 I think I will make the "Noel" one in pink for my granddaughter Noel! Have a great week Susie! Gorgeous! 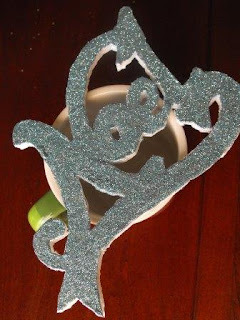 I love all the glitter that is around now. I have a couple of things but now I know how to make them...Thanks for the tips. These are FANTASTIC! 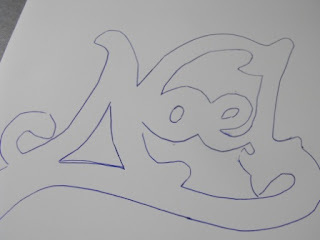 Thanks tons for this. I'll be linking. Cool! 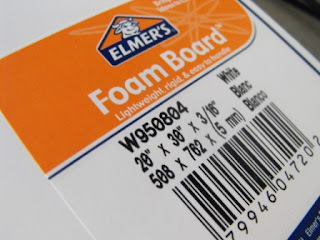 Foam core is so multipurpose. I use it as a base for gingerbread houses too. Way stronger than cake board. How beautiful. I would love to try this for Christmas. I love the glitter! The words are beautiful and look so pretty on the tree. 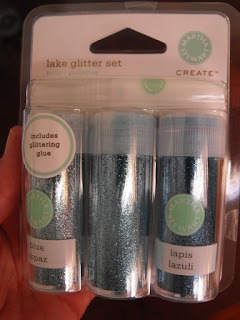 I'm going to have to find some glitter that matches my color scheme this year! Absolutely wonderful! The words are gorgeous! 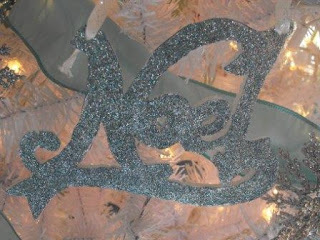 Great job on the glitter words - so pretty! I copied something of yours. No worries, I am not going into business anytime soon! Go see my blog and you'll know what I'm talking about! I love all of the glitter! How did I miss this post??? I LOVE those glittery words!! BEAUTIFUL! So creative! I might just have to copy this idea! I can see the glittery mess now! Fun! Great idea. I've seen those all over the place. Yours are fabulous! Hobby Lobby here I come!!! Your glittered words turned out beautiful. You are so clever! I was so drooling over that MS glitter at Michael's last night. But the budget won out over the glitter-lust. I found those at the 99 cents store. They're beautiful! Brilliant idea! Thanks for sharing with us. My daughter saw something like this over the weekend and wanted it so badly! Now I can just make it for her! wonderful! Thanks for sharing such a cool idea!! 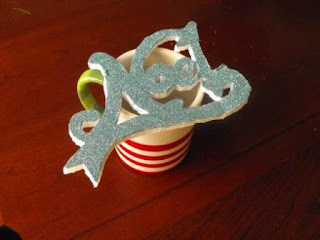 Hi, I just clicked over from the CRAFT: magazine blog. Thank you so much for sharing this fantastic idea. 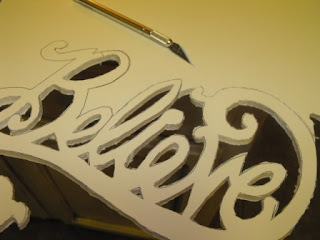 I love playing with my X-acto knife and paper and never thought about foam board before, so much fun!